We have featured a few of these in the past, not least a number of eBay finds. 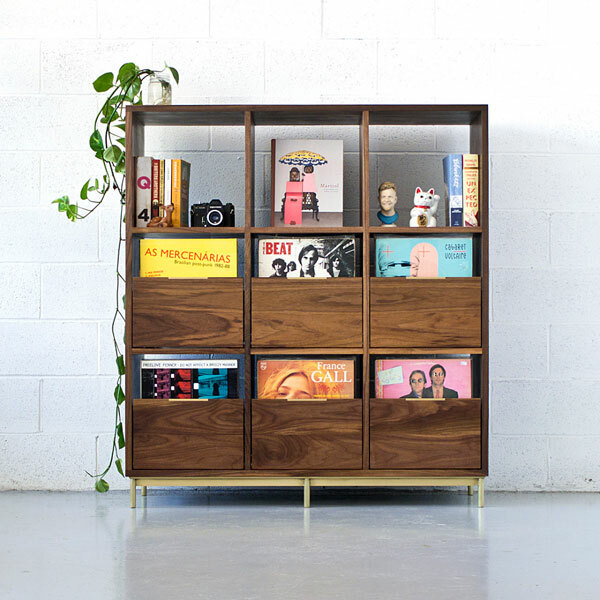 But if you want new, check out the top 10 retro record storage units available right now. Room for a record player on most too. 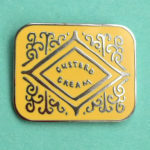 We are actually going to feature two designs by this maker as they really do have so many to choose from. 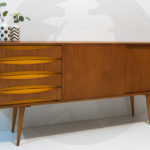 Our first pick it a unit that could pass for a midcentury modern sideboard. 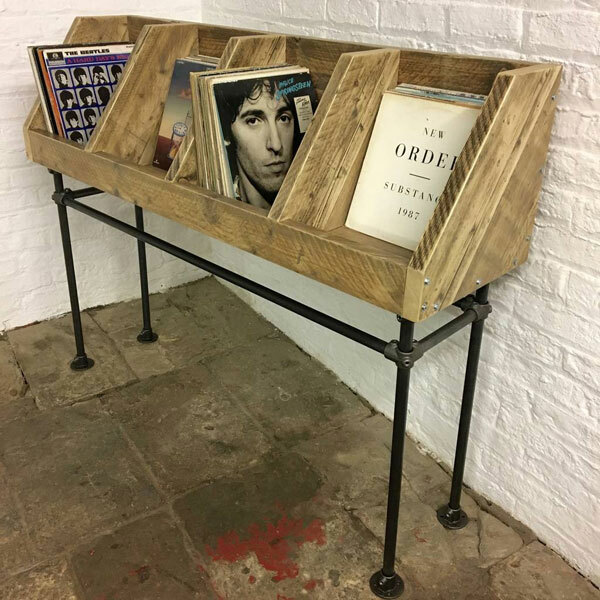 Handmade, this is available in various colours., with the cupboard perfectly sized for 12-inch vinyl and the surface able to support a deck. Functionality and style. Expect to pay between £330 and £350 depending on your finish. We only featured this one recently, but it proved hugely popular so was obviously going to hit the top 10. 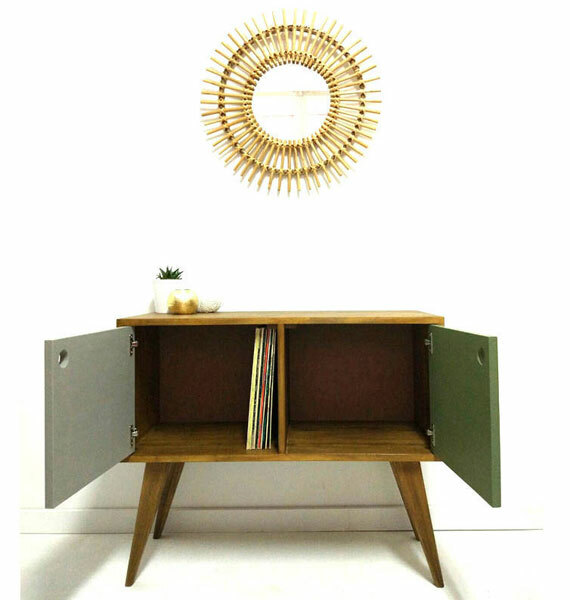 Again, a design that could pass as a midcentury sideboard and able tho double up as one. But the option of those vinyl storage slots at the end is the killer feature here. Although we love the tapered legs with brass tipping too. A step up in price, with this one going for £1,500. Something very different, but familiar at the same time. Yes, this is the kind of racking you would expect in a record shop, with the ‘bins’ perfect for flicking through. But the finish is unusual, a mix of scaffolding board and gas pipes, with the unit produced by hand in an old Victorian hat factory in Manchester. £895 for this one. This one isn’t just about the vinyl. But a good option if that’s what you need. 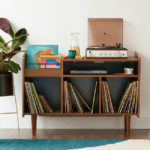 A midcentury design that is (again) made to order, it can handle vinyl, books, CDs or pretty much anything within reason, with a surface deep enough to hold a record player too. Different designs, but prices are from £229. There’s no ambiguity about this design. 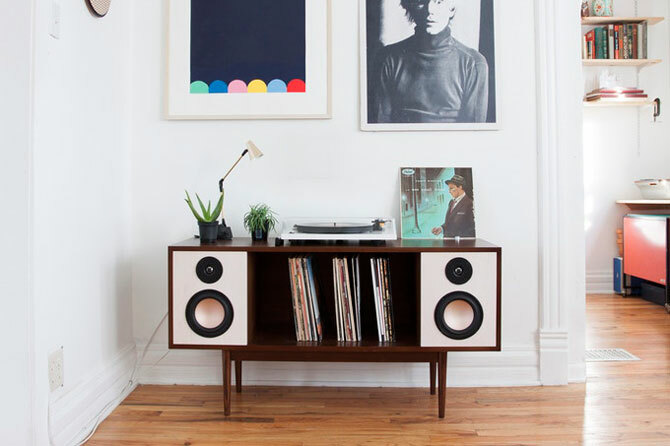 It is all about 12-inch vinyl storage. Again, room for a player and in this case, industrial-style hairpin legs. 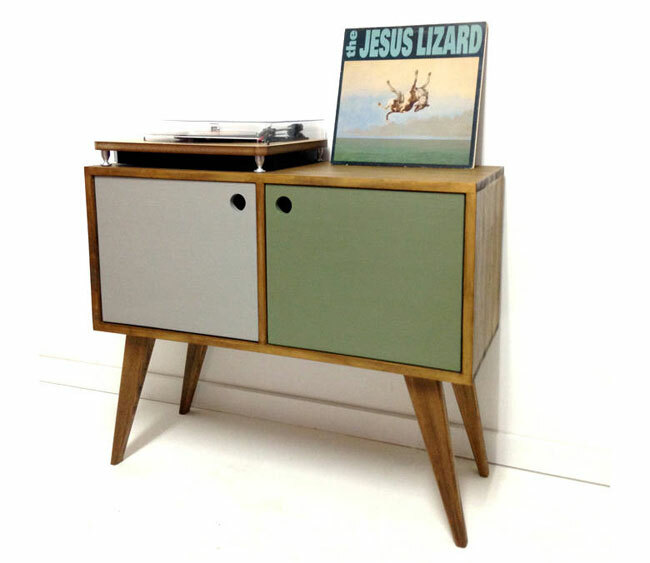 But you are buying this for the ample space for that vinyl over those four slots. £385 for this unit. Another recent feature. In fact, this was on the site just last week. 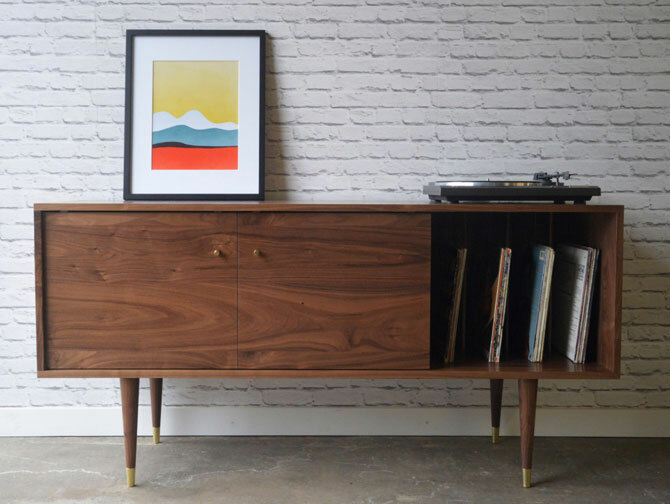 Popular though, down to its appeal as a midcentury sideboard and general storage unit plus its vinyl storage section. 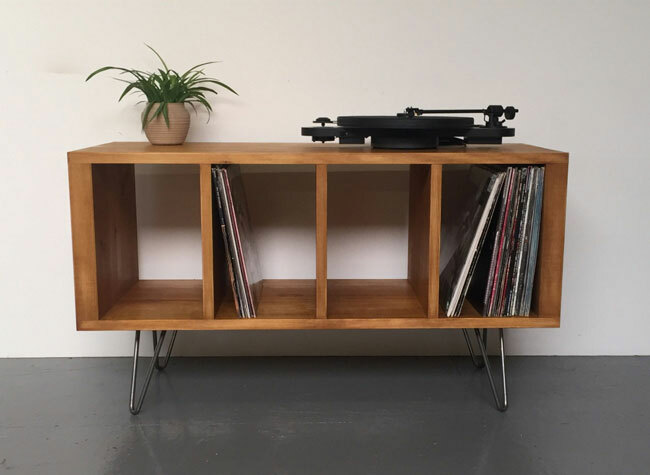 Someone mentioned that the area with the glass lid might fit a record player, but you will need to check the dimensions if that’s your intention. £750.50 is the price. Never previously featured on the site, but certainly worthy of a mention. 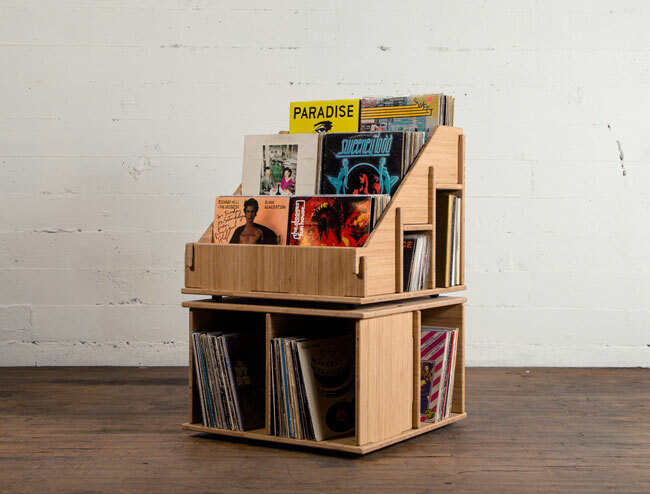 This is compact, flat pack record storage. No tools are required, you’ll be pleased to hear. You just slot these units together, which offer ample storage for both 7-inch and 12-inch records over a small footprint. Different finishes too, although some have already sold through. Prices are from $725. Much more to this than simply record storage. 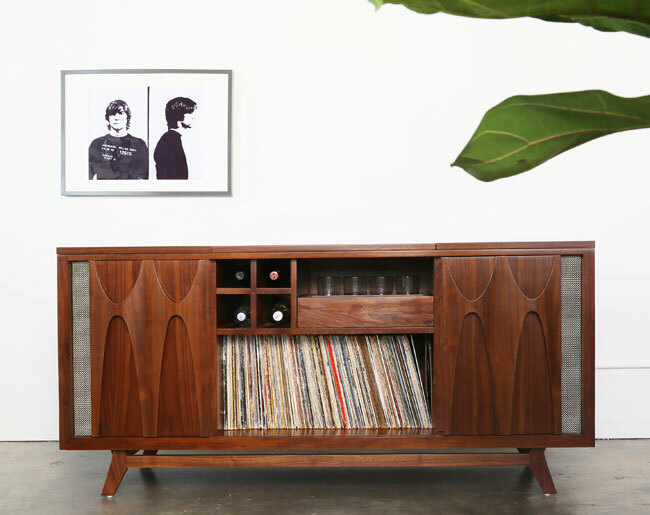 Described as a ‘Mad Men’ inspired audio system, this custom-made unit offers a Pro-Ject Debut Carbon deck, wireless connectivity, two-way speaker system, storage for 150 records and a mini bar, all in a cabinet made of American walnut. Price is on application. We can presume it doesn’t come cheap. A second entry from this Spanish design team, which pretty much specialises in the concept. This time it’s a storage space, vinyl area and hairpin legs. 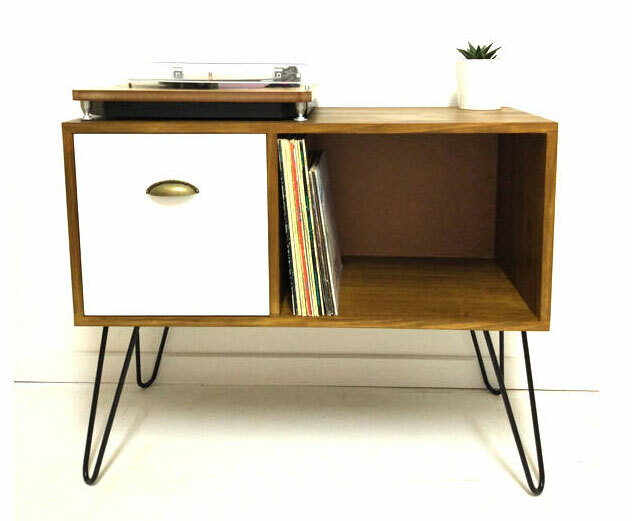 Compact enough for smaller spaces but large enough to host a record player and a good few records too. £333.18 for this one. This was a Kickstarter project, but you can order it now. 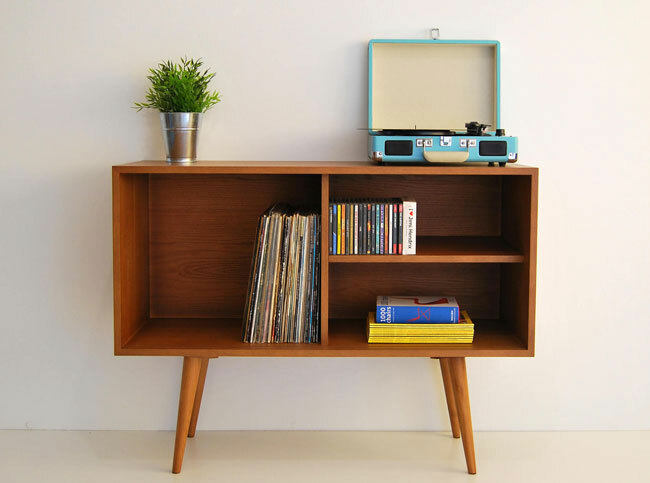 A stunningly attractive unit, it has room for your records (at least 120) as well as a Bluetooth-enabled amplifier, connecting wirelessly to all your enabled devices, with inputs also for your TV, record deck and other old school audio. $1,695 is the asking price. 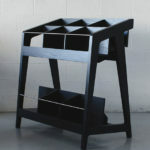 We didn’t quite have time for the Korgis record cabinet and bookshelf by Mitz Takahashi. In fact, we’re not sure if it’s available to buy. But if you want to admire this retro gem and perhaps talk the maker into selling you one, check out the website.